Discussion in 'Guitars in General' started by kool98769, Jul 21, 2008. What does TGP think of lace sensors? Specifically, golds, silvers, and blues. 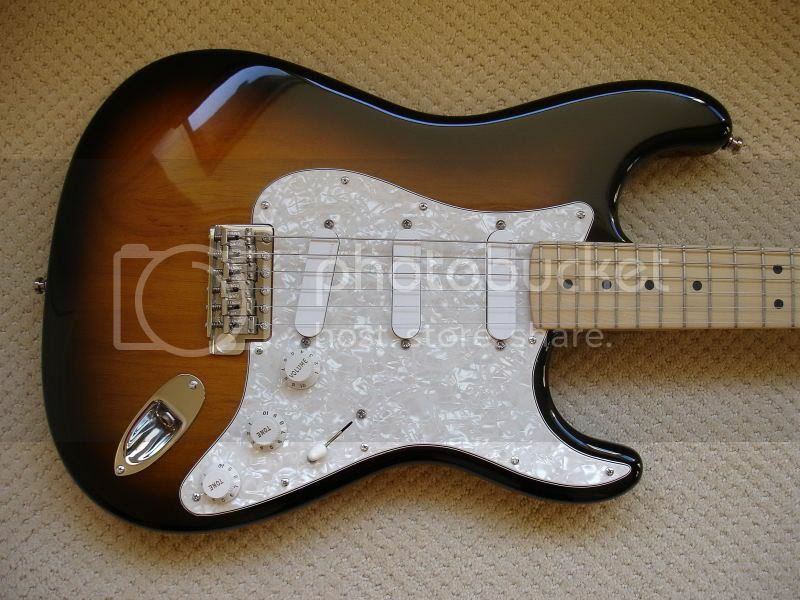 I'm interested in perhaps getting a set for my squier strat to make it atleast usable, in comparison with my rg 550. Or would it just be better to go for a good ole set of dimarzios? I'm not really interested in going handwound, as i dont want my pickups to be double the value of the guitar itself. But honestly, what do you guys think of lace sensors? I'm putting some trust in you guys, as no local shops have any guitars with laces in them, so i wont have a chance. I like'em. Particularly the blue and silver. Blue, silver, red set is a really great matchup. (per strat plus deluxe) Great quack sounds, fat neck and bridge tones. Pretty near silent, so great for recording. Friend of mine has a plus with all golds, also a great setup. More of a vintage/traditional vibe. Very low string pull in all cases, so better sustain. They're ok, but on the dark side. If you're into finger picking on electric, I've found them to be dynamically forgiving. I wouldn't want to use them now, but when I did they were ok. It may sound a lil radical but i d rather go for EMG than lace sensors. I like real vintage pups, or something totally different such as EMG, Joe Barden but I never got used to anything in between such as Lace and noiseless in general . I had a Strat Plus Deluxe with Red, Blue & Silver & didn't care for them. Seemed sterile & lifeless. I really hated the Red in the bridge position. My Buddy Guy Signature Strat is loaded with them and a mid-boost circuit. It works very well indeed! I have played Strat for 40 years & have used LOTS of pickups. Lace Sensor Hot Golds are right up there on my all time favs list. They are warm, full, quacky, chimey & just plain musical! (Pretty quiet too). lots of Love and lots of hate out there on those..
Have had them in my Strat Ultra since the day I bought them in about 95....Red, Gold, Blue (HSS:bridge, middle, neck). I love em...The red's seem as hot as my les paul, and hotter them my other strats lindy fralin vintage hots. They sound better than my friends Noiseless pick ups in his EC Sig strat. I love the silver in the mid position of my strat deluxe. It is very clear and balanced to me. I do not like the blue in the neck position -- too boomy. To me, the red in the bridge is very average. The only thing that makes mine usable is having a tone control that also has tbx. As for EMG singles, what about those? I don't really have any experience with them, but are they high output like the EMG humbuckers? I mean, dave gilmour and the dude from toto use them, but are they a bit of a better sounding pickup? I had Gold's in the neck & mid & a blue in the bridge in a '88 Am Std. I also added a roller nut and locking Sperzels. I modded the guitar to the point it was too much of a rock 'n roll machine for me but it sounded good. I think they're decent pups but there seems to be many more great choices today. Cool - Those Hot Golds - were my designing skills and I also named them that. It was my answer to what customers were asking us for.. I know there's a lot of love and hate going on about the Lace Sensors. I think the issue is mostly people trying to compare them with vintage single coils. They are their own thing. Not better, not worse, just different. I used the Blue/Silver/Red stock in a Fender Deluxe Plus for many years and coaxed a lot of musical tones out of them. My desire for some classic strat tones moved me to try the Suhr V60LPs, which I love. But sometimes I miss the slightly fatter tones of the LS's. They were almost P90-ish. I still have the populated pick guard. I may pop them back in some time. Got a late 90s Clapton strat with gold Lace sensors. They just don't seem to like wah pedals as much as my other strat with "normal" pickups. Otherwise okay but a little sterile for my taste. Replacing them is a bit of a pain in the Clapton as you do need noiseless if you want to use the mid boost otherwise it gets a little noisy.